This weekend just gone was the third BLL event that I’ve had the pleasure of attending, but the first one I’ve attended from the ‘other side’. It was a whirlwind of activity, people, signings and near-hysterical laughter on Sunday, and a lot of things have faded out of my memory already. But here’s what I recall. We arrived in Nottingham at around 11.15am and headed straight for the bar where we acquired the life-giving coffee. No sooner had we sat down to start drinking it than the fire alarms went off and we were pitched outside in the sunshine. We stood around for a few minutes looking like tourists before whoever had burned their toast (which is what invariably happens in the NHS, I may be generalising) sorted it out. So deprived of my coffee, we headed into the hall with Alec, one of the many Boltholers who made this weekend so much fun. We unpacked armies and began what turned into the longest game ever. This is largely because I’m a complete learner, and Dearly Beloved has to tell me every few minutes what the heck I’m meant to be doing. It was a fun game; Space Marine-on-Space Marine action. Because we both fielded loyalist armies, we called it a ‘training mission’, and there were a few really entertaining moments. My Dreadnought stomping his way across the table to boot the Master of the Forge. Toe-to-toe Assault Marine action and Xhalax’s all-important ‘Kiss the Librarian’ ritual which ensured Prognosticar Phrixus was as enormously cool as he turned out to be. Much fun was had and when the army had won, which I am not smug about at all, oh no, they were put into one of the display cabinets in the main hall at WHW. Very pretty they looked as well. Dearly Beloved did a brilliant job with them. 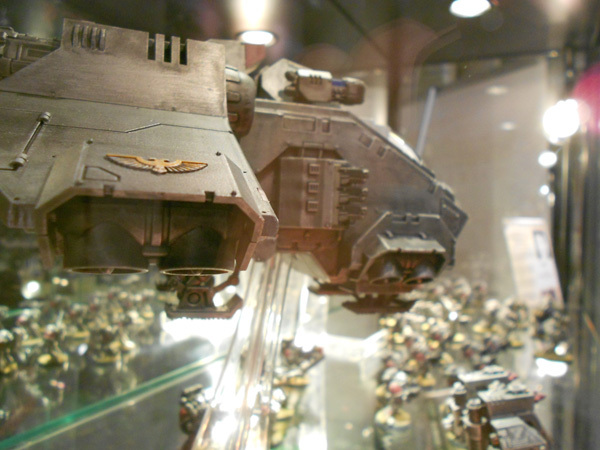 Across the Stormraven into the cabinet. We retired to the bar where we chatted well into the evening with the many folks who turned up. I popped across to the hotel so I could check in and then came back. Even more people had arrived and Bugman’s was heaving with people laughing and chatting and drinking… I had far too many glasses of Coke and bottles of water trying to keep up with them. Spent an inordinate amount of time chatting with Josh Reynolds, who is frankly great company and his stories are out of this world. Eventually headed back to the hotel and sat in the hotel bar for a last-of-the-night drink with Josh and Dearly Beloved. Spent the rest of the weekend recovering from the sheer horror of hotel drink prices. Went to bed. Failed to sleep. The day of BLL2012 dawned and we met Bill and Josh in the foyer so we could head off for breakfast. We arrived at BL Towers around 9.15am or so and the queue was heading around the building already. People certainly seemed to be in very good spirits and so we headed indoors and got our badges. Dearly Beloved engaged in the important task of buying New Things and we now have copies of Void Stalker, The Primarchs, The Best of Hammer & Bolter Anthology and a couple of audio dramas – Eye of Vengeance and Butcher’s Nails. I like new things. Managed to read Void Stalker and the first story in The Primarchs so far. Graham McNeill is my hero. That is all I have to say on the matter. I was on three seminars throughout the day and had a signing session at lunchtime. The morning kicked off with a seminar on Space Marines, at which point my memory closes down completely. I am actaully incredibly nervous when there are so many eyes on me and being seated on a sofa at the front of the large room with Many Faces means that my mouth opened and words came out. I possibly said useful things. I don’t know. The same was repeated an hour later during the Warhammer panel. Then I had some Spare Time, where I went and drank the largest cup of tea known to mankind and grabbed a bag of crisps. I was too buzzed to sit and relax, so I went back downstairs and enjoyed conversations with an assortment of people in the bar before heading to the other seminar room for the last panel of the day. This one was a lot easier; it was the ‘Hammer and Bolter presentes… New Talent’ forum and there was Andy Smillie, Josh, myself and John French having what turned out to be a pretty informal chat with a bunch of awesome folks. The fantastic artwork that had decorated the stands during the day was raffled off, and the lovely man who won the Valkia poster made a gift of it to me. 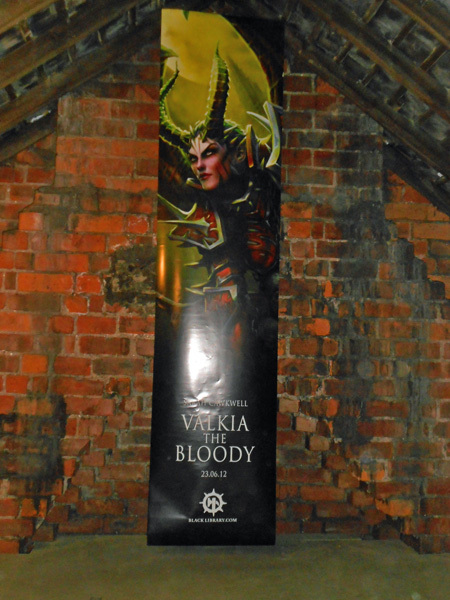 It’s now hanging in my boarded-out-loft, waiting for the games table to get set up. I was really touched by that… thank you. Valkia checks out her new home. The evening rolled on and much more mirth and merriment abounded in the bar. Again, I was all out of space to store water and orange juice, so we headed back to the hotel. We returned to Bugman’s for breakfast in torrential rain and largely chilled out for the entire day. We indulged in the company of people who’d travelled far and wide for the event – Jeff and Kay from the USA, Abhinav from Dubai… and I marvelled, as I always do, at the loveliness of these people. Much hilarity ensued during a conversation where we were substituting words of book titles with a specific Other Word that made one member of our table laugh uncontrollably every time he heard it. In time, we were summarily kicked out of Bugman’s and drove home, where I finally got some sleep. It was an amazing weekend, with conversations with some incredible people and a meeting with folks both known to me and who I really look forward to seeing again. A huge, huge thank you to all the Black Library staff, the other writers and especially to the fans who made it such a wonderful weekend. Not long to the BL Weekender! OK, it’s eight months, but you know what I mean. This entry was posted in General, Writing and tagged Black Library, I'm an author now, life, Valkia the Bloody, W40K, weekend, Writing. It was a ton of fun to meet you and Ben again. So much better than GD since we had more time to chat and be relaxed. Thanks for the warm welcomes as well and for getting me an Ed out of that rain on Sunday! It is usually always burnt toast in the NHS, but in recent years in our spot it’s been hair-straightners LOL!! Roll on November! !